The data sets used for this example are the same as those used to illustrate PROC CPM in Example 4.2. The data set WIDGAOA defines the project using the AOA specification. The data set DETAILS specifies the abbreviated and detailed names for each of the activities in addition to the name of the department that is responsible for that activity. Notice that a dummy activity has been added to the project in order to maintain the precedence relationships established by the WIDGET data set of the previous two examples that define the same project in AON format. The two data sets WIDGAOA and DETAILS are merged to form the WIDGETA data set that is input as the Activity data set to PROC CPM. The data set SAVE produced by PROC CPM and sorted by E_START is shown in Output 8.6.1. 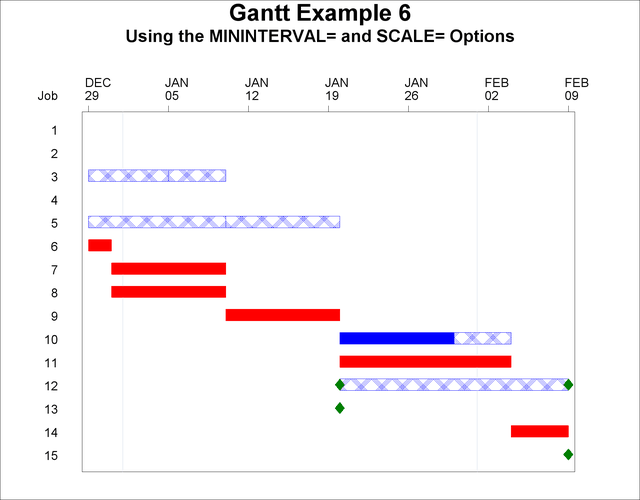 Because MININTERVAL=WEEK and SCALE=10, PROC GANTT uses (1000/h)% of the screen width to denote one week, where h is the value of HPOS. Note that this choice also causes the chart to become too wide to fit on one page. Thus, PROC GANTT splits the chart into two pages. The first page contains the ID variable as well as the job number while the second page contains only the job number. The chart is split so that the displayed area on each page is approximately equal. The first two PATTERN statements, indicating the duration and slack time of noncritical activities, have been changed from the previous two examples. The duration of a noncritical activity is now indicated by a solid blue bar, and the slack time is indicated by a crosshatched blue bar. The milestone color is changed to green using the CMILE= option. 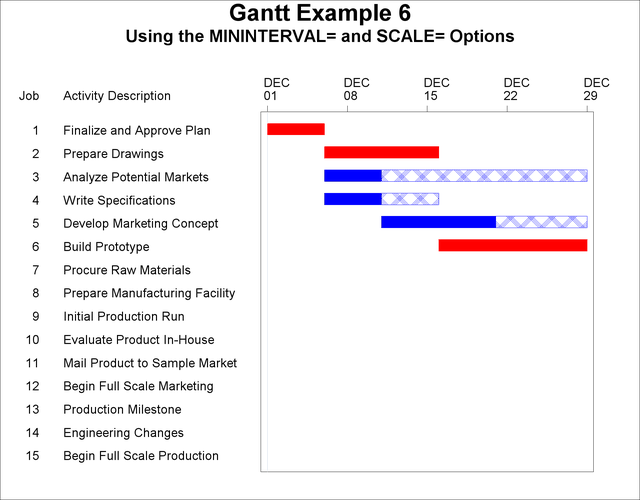 The resulting Gantt chart is shown in Output 8.6.2.